An Alpine ski chalet by the Thames? Yes, please! Still complaining about the cold? Let’s be honest compared to Pyeongchang (-12c nights, anyone?) we’ve nothing much to moan about. If winter’s your season the Après London in Southwark is the the place for you. It’s a mocked up, alpine ski chalet on the banks of the Thames and is celebrating all things wintry. There’s a mix of live music, parties, hot cocktails and street food. 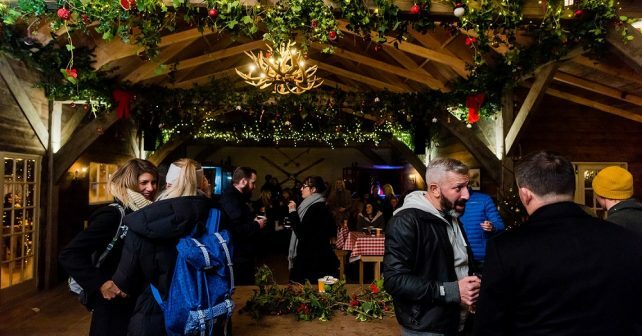 Look out for the piping hot and reasonably priced glühwein (£6), as well as a wide mix of wines, beers and ciders. There’s definitely a sporty vibe too with the 6 Nations and the Winter Olympics on the giant screens – and DJs spinning tunes every Friday to keep the crowd happy. Who needs spring!